If you travel to other Chinese cities on a regular basis, you know what a hassle paying for public transportation can be. But the days of stocking up on spare change may soon be over: a nationwide public transit card, usable on both bus and subway in over 100 cities, is due to be launched in the first half of 2018. The cities include Beijing, Shanghai, Guangzhou, Shenzhen, Tianjin, Suzhou, Hangzhou and Nanjing, among others. The new card will have a 'China T-union' logo in the corner, and be compatible with any terminal that has a corresponding icon. China T-union is a Chinese traffic card system developed jointly by the Ministry of Transport, Transport Bureau, Citizen Card Company, Urban Construction Group and Public Transport Group. By 2020, most of the country will be integrated into the new system, and the card is planned to cover all types of public transportation (i.e. metro, bus, taxi, ferries, etc.). 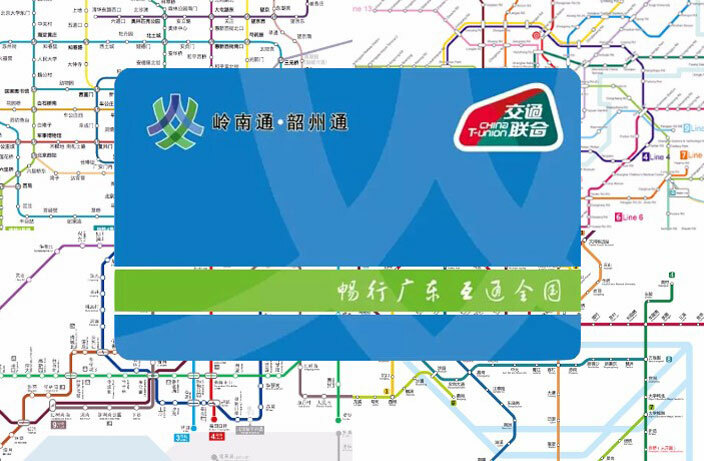 The earliest implementation of the system came in 2015, when a transportation card was issued to connect Beijing, Tianjin and Hebei. Since then, other upgrades have been gradually added, including the ability to use mobile payment platforms such as MI Pay, Apple Pay and Huawei Pay to purchase and top up the cards. Along with the nationwide card, a province-wide pass will be released for Guangdong: the 'Lingnan Tong.' For local residents who don't plan to travel far, there are some cool benefits. For one, through a partnership with Ofo, the card will be compatible with some shared bikes in Guangzhou. In another, somewhat gimmicky-sounding scheme, travelers will be able to 'share' Lingnan Tong or Guangzhou public transit cards. Designed for those who don't plan to stay long, the new system will allow people to rent and return cards at machines in Guangzhou's Baiyun airport, high-speed rail stations, subway stations and other transport hubs. Meanwhile, bus travel across Guangdong has already seen a major upgrade. At the end of November, China's Ministry of Transport announced that fourteen cities in the province, including Guangzhou and Shenzhen, can now be traversed using a single card. A successful pilot run in seven cities last year led authorities to expand coverage. Besides Shenzhen and Guangzhou, cardholders can now also access buses in Dongguan, Zhuhai, Shanwei, Zhanjiang, Chaozhou, Shaoguan, Huizhou, Jiangmen, Heyuan, Jieyang, Yunfu and Zhaoqing. Be careful of pickpocketing and other petty crimes during the Lunar New Year in China. Staying in China for CNY? Here's what to expect.